It’s become a hobby for tabloids to alternate their weekly Jennifer Aniston – Justin Theroux breakup stories. 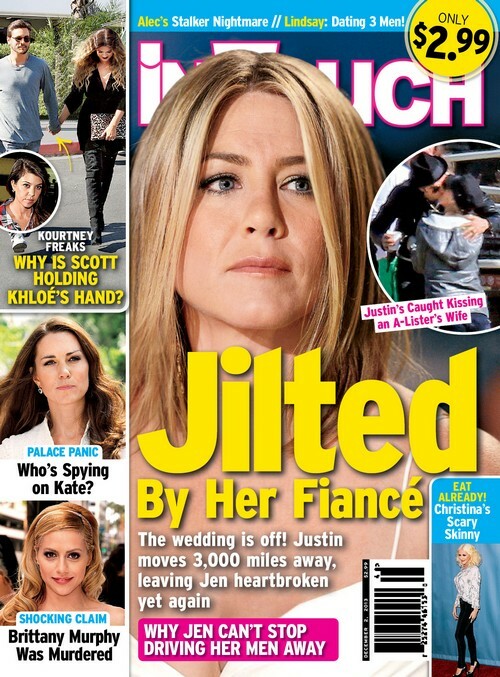 This week, In Touch Weekly’s cover issue is devoted to Jennifer’s and Justin’s millionth breakup, where they claim that Justin has called off the wedding and moved back to New York City. I mean, why not? They already broke up five times this month, and Justin’s already ‘abandoned‘ Jennifer and moved to NYC about three more times. Really, the tabloids needs better inspiration, but they’re not getting it. In Touch rehashes the same story told again and again. Jennifer ‘jilted’ by her fiance, Justin calling off the wedding, Justin moving 3,000 miles away, Jennifer ‘heartbroken again‘. I’m not the biggest Jennifer Aniston fan in the world, but it’s quite sad how the tabloids always insist on blaming all these rumored breakups on the woman in the relationship. The subheading of the report reads, ‘Why Jen can’t stop driving her men away’, as if it’s all because of her that Justin supposedly left. For once, why can’t they blame the dude, especially since HE was the one who was rumored to have cheated on Jennifer, not the other way around. In Touch also has a feature on Brittany Murphy‘s death, and all the new claims that came to light this week on her death being the result of possible poison and murder. There’s also a story on Kate Middleton, and some royal drama. According to the report, somebody is spying on Kate, and the royal palace is all in a tizzy trying to find out who it is. What do you guys think of Jennifer’s and Justin’s rumored breakup, and the other stories featured on In Touch this week? Let us know your thoughts in the comments.